Bangkok: Aung San Suu Kyi and her government are "burying their heads in the sand" over the violence in Rakhine state, Amnesty International said on Tuesday, criticising Myanmar's leader for failing to condemn the army's alleged abuses in a televised speech. The United Nations, rights groups, and a tide of Rohingya refugees pouring into Bangladesh have accused Myanmar's military of using bullets and arson to wage an "ethnic cleansing campaign" against the Muslim minority. 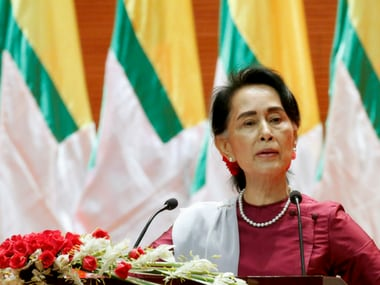 In her speech on Tuesday, Suu Kyi expressed sympathy for the "suffering of all people" swept up in the violence but did not address accusations of ethnic cleansing. She instead said only that anyone guilty of rights abuses would be brought to justice. "Aung San Suu Kyi on Tuesday demonstrated that she and her government are still burying their heads in the sand over the horrors unfolding in Rakhine State. At times, her speech amounted to little more than a mix of untruths and victim blaming," Amnesty said. The rights group blasted Suu Kyi for remaining "silent about the role of the security forces", whom they have accused of being "engaged in a campaign of ethnic cleansing". The watchdog also criticised Suu Kyi's call for international observers to visit Myanmar to assess its troubles for themselves, citing her government's blocking of a UN fact-finding mission to probe alleged army atrocities in Rakhine. "Aung San Suu Kyi's claims that her government 'does not fear international scrutiny' ring hollow... If Myanmar has nothing to hide, it should allow UN investigators into the country, including Rakhine state," Amnesty said.